Q&A Video #1: How To Prepare A Warm Lunch Without Microwave? Video Q&A #1: Warm Lunch without Microwave? Welcome to the first Video Q&A at traditionalcookingschool.com. We'll have many more of these in the coming weeks! You'll see my answer in the video above. 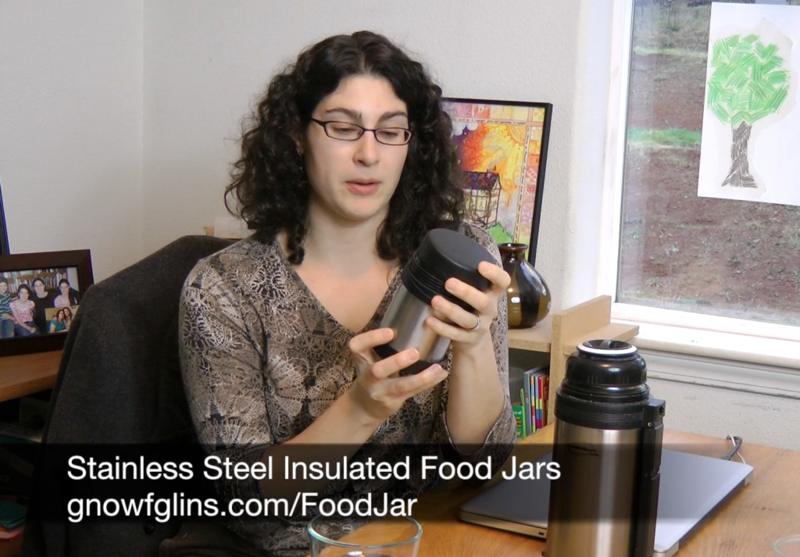 Basically, it comes down to using stainless steel insulated food jars. We have an assortment. Some for single servings, and a couple larger coffee thermos' with wide mouths that fit lunch for the kids and I when we're in town. I reheat leftovers (according to Reheating Foods without a Microwave) to fill an insulated food jar. That goes in a cooler with beverage and other jars/glass bowls of food that don't need to be kept warm. Like kefir/fruit, hummus, cold salmon salad, etc. The ice in the cooler keeps the cold foods cold, while the insulated food jar keeps the warm food warm! “Temper” the food jar with hot water for 5 minutes before filling it with hot food. This helps keep the hot food hot longer because it doesn't cool down initially from a cold jar. To de-odorize a food jar, wash with soap and water as usual. Then fill with water and a splash of vinegar. Let soak overnight. Periodically, take apart the lid (if your food jar does this) and wash any rubber gaskets separately, scrubbing out the grooves of the lid with a small cleaning tool. How do you provide a warm lunch out and about without using the microwave? Like my free videos? Please use the buttons below to share this video with others. And subscribe to the Traditional Cooking School Channel on YouTube — you can give this or any other video a thumbs-up! Thanks for the helpful tips! Another suggestion is, I send my husband’s hot lunch in a small crock-pot that he just plugs in once he gets to work. You can find the 1.5 quart crock-pots at Wal-mart for around $15-$20, I believe. It’s a perfect size and cleans up easily. It works great for us! Christine — What a great idea. Thank you! The crockpot is an excellent suggestion for those who can do that! In fact, I have a small fondue type crockpot that would probably work well for that purpose. I’ve also use those types of containers you are showing Wardee. I found one at starbucks awhile back that was meant for keeping hot oatmeal. But I just add hot water to it, heat my soup really hot and then add that to the hot container and it stays warm for a long time. Tara — That’s a good idea (the fondue pot)! Once I got a toaster oven for my birthday in 2010, I truly left behind the microwave. Don’t think I had used it much before then but that really insured I never would consider it. We went sans microwave 17 years ago and I have never looked back. It is funny because my parents bought a super deluxe microwave back in 77 and I learned how to cook complete meals (meat loaf, chicken cacciatore, etc) and we rarely used the stove. I have friends who feel sorry for me having to spend ‘so much’ time in the kitchen each day but I love it, making real food with real cooking methods. Anyway, thanks for being there to affirm what I already know and to remind me that I am not crazy :). Oh, I got 15 pieces of lidded storage pyrex like you showed at black friday for a super deal and am loving the versatility. This is brilliant! Can you please tell me what brand/type of immersion heater you have? Reading through the reviews, many seemed to indicate they didn’t last long or didn’t work very well. Thanks!! I have used my small lidded Pyrex bowels (straight from the fridge) and placed them on top of an electric coffee warmer at least two hours before lunch. It works great most times unless a chunk of meat is really thick. Years ago, I would wrap my food in foil, place it on the heaters in the morning, and cover it with a box. By lunchtime, my food was at a comfortable temperature. During the summer months, I’d put hot water in a large bowl and put my food–enclosed in a plastic container–inside of the water. Now that I’m transitioning to a raw food diet, I just leave my food out and eat it when it reaches room temperature. We’ve been microfree for years now, but I still struggle at times. I agree on the crockpot; it feeds my kids and I at our weekly co-op at lunch, while everyone else is having lunchables. However, while I always pack food for my husband for work (railroader gone 2 days at a time…), it’s impossible to send him with a crockpot. I have an immersion heater that I LOVE but it doesn’t work to heat some things, like casseroles. Any suggestions? I guess I could send all cold stuff and just hot soup to be heated with the immersion heater…. Hey Wardee! I got a question. There’s an article on the WAPF site that warns against using stainless steel, even in thermoses, as it can leach heavy metals, particularly nickel. (http://www.westonaprice.org/environmental-toxins/mad-as-a-hatter) What do you think about that? I’m about to get me some food jars, and I’d like to heed their warning, but I can’t even find glass ones listed as an alternative to the stainless steel. And before learning about the nickel issue, I was under the impression that stainless steel was relatively inert and totally safe. Hmm. I’m wondering if this is one of those times where worries about safety have gone a little overboard… do you think? I’d love to hear your input on this! Emily — Stainless steel is minimally reactive. I am totally fine with it if the contact is momentary, but using it prolonged does give me pause. I don’t have a better choice for warm lunches that works for us, though. So we choose to do it anyway. The biggest risk are acidic foods — like tomato based soups and sauces. I spent some time looking for the old Thermos style — the ones with glass liners. I could never find any. 🙁 I do remember growing up that my parents had them and they were always breaking! I found some glass insulated food jars on the Thermos website. Loving your site and glad I found it! I’ve been doing this with my kids lunch since beginning of school year and makes me happy! My hubby just got a job where he won’t have access to microwave so I have to get him a thermos. I’d like to quit using our microwave too! Sometimes I am good at not using it – it’s going to be a process to get used to! Interesting that we are going back to the old ways…before microwaves thermos bottles were all we had to transport hot foods in…mostly soups. Can NOT persuade my husband to get rid of our microwave. I’ve been reheating things other ways for a year now, but he still uses it. I’ve had him read articles, etc. how I’d love to have that counter space for other uses. Thanks for the suggestion! We have a small inexpensive toaster oven that I use a lot. I think getting a more useful one could help. The update is that I persuaded him to put the microwave in the basement, packed away, for a month. He’s been reheating things on the stove top or in the small toaster oven. It’s been two days and its still there. I’m cautiously optimistic! Wardeh, so good to ‘see’ you! Kristin Humphrey Benini, what about saving up to replace the microwave with a toaster oven? I was in the same boat and put my foot down because this was one area that meant the world to me (our health) and it takes a while to get used to it, especially with converting someone who is a faithful microwave user. In marriage there are things I let go because it’s not worth it to argue all of the time over little things. We usually compromise but the microwave was something I could not, in good conscience, let go. He got used to it and doesn’t get bent out of shape anymore. Lol! It is my understanding (from a friend who lives there) that Germany (or at least parts of Germany) have BANNED microwaves all together in homes. YAY! I don’t use mine anymore at all. Sue Derosier Varney, I was thinking the same thing the other day, love that the plastic is going away, I use glass refrigerator dishes (love my vintage pyrex), and mason jars! Let’s get back to the more natural way of life, we are so much better off for it! We are getting varying results with the same st/steel thermos preheated the same way. The density of the foods and their level of heat going in could be factors but I am also wondering if the ice in her lunch bag for the other items could be cooling it faster. It take it from reading this that you don’t think that ice packs in the same container will influence the heat of the thermos contents? i am glad my microwave broke down last year!! it was hard for my husband who wanted to run out and purchase another. But, I focused on not being able to afford one to change his mind because he doesn’t care to know about the harm it causes our health. LOVE the video! Thanks for educating us! I use the mini crockpot too — leave the unit in my office and purchased extra inserts. bring the inserts in my lunch bag to work — can be frozen (if so, put them in crock when I arrive at office) or if cold, put them in about 45 minutes before I want to have lunch, and a perfect winter-ready hot lunch that’s healthy and delicious. It’s saved me a ton of $ by eliminating take-out. I have a coffee warmer at work and put my lunch container (ceramic) on it and have a lovely warm meal. Toaster oven. Our microwave has been repurposed to storage. I have the Mr. Bento food jar. Keeps food HOT for up to 8 hours ( I notice it starts to cool at about 6 hours. But still warm hours 6-8) I have put steame veggies, soups, rice, and chicken in them along with many other things. It’s so awesome. And easy to clean. I use a mr. Bento food jar. They are made in japan. They keep food hot for 6-8 hours. I love having my hot lunches. And the mr. Bento is easy to clean. What are your thoughts on the mini crockpots? The ones that just reheat? Safe materials? I want to get one for my husband at work. I tested a few thermoses and found most keep food warm, not hot, after a few hours. I have yet to buy the Zojirushi brand as they are expensive but I read they are the best. I use the mini crockpot which I leave at work. My food is prepped in mason jars and I just take one out of the freezer the night before, thaw, and pour it into the mini crockpot in the morning and 2 hours later it’s PIPING HOT! For non- soupy food I place just a little water and a canning lid to hold a small bowl/plate to steam. Works just like a steamer pot on a stove. Or, to keep warm food warm you can wrap a plug-in heating pad around the container. Lastly, warming the thermos inside with hot water before putting in cooked food definitely keeps the food hotter longer. My job gets trickier…I want to stop using the microwave, but I typically pack casserole type lunches and I’m at a different site everyday (so I can’t bring my own crockpot easily or toaster oven–toaster oven being my preferred method in the past). Every site I go to only has a microwave. Soup is not substantial enough for me (and is a bit harder for me since I’m gluten free). Ideas?